 A mandoline makes beautiful, ultra-thin, even slices (photo courtesy Microplane). Slicing perfectly even julienne carrot strips (photo courtesy Kitchen Expert). 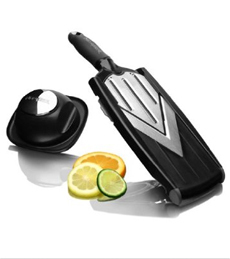 If you don’t have a mandoline slicer, it’s time to think seriously about getting one. A mandoline (man-doe-LEEN) is a kitchen utensil that makes thin, even slices, from juliennes to crinkle-cuts and waffle cuts. Even chefs with top knife skills use one to ensure the perfection of every slice. Very thin slices can be made very quickly with minimal skills. A vegetable, fruit, meat (think sausage), firm cheese or other food is slid along the surface until it reaches a razor-sharp blade that makes the cut. The process is repeated until the entire potato, carrot, etc. is cut. 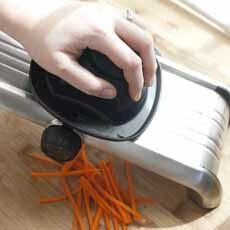 Perhaps most importantly, the item that is sliced is held by a safety food holder, to ensure that fingers aren’t julienned along with the potato. The bigger the holder, the better. The style shown in the photo, that looks somewhat like a brimmed hat, is the best. Mandolines that scare us have a flat plastic plate that fits in one’s palm. After trying some mandolines so flimsy that we were scared to use them, we’ve settled on the Microplane Adjustable Slider Food Slicer. The stainless-steel blade effortlessly slices cheese, fruit and vegetables, adjusting from paper-thin slices to 1/4-inch cuts. The handle is ergonomic and the feet are non-slip feet (not so with the feet of some other units—another scary factor). Get a mandoline and try your skill by whipping up a batch of paper-thin potato chips or sweet potato chips. According to Chef Harvey, the first known illustration of what became known as the mandoline was published in 1570 in a cookbook by no less than Pope Pius VI’s cook. The illustration shows a small board with a central cutting blade and perpendicular blades to cut vegetables into thin sticks. One argument is for Marcel Forelle of Toulouse in the south of France, who named it after the mandolin because cooks would “play” the mandoline by going over the blades as a musician would go over the strings of the instrument. Others credit Dr. Joseph-Ignace Guillotin, the French physician who championed the use of the guillotine* around 1789 (for more humane beheadings). One could imagine him adapting that blade concept to the kitchen; but when we read that he named it ex-girlfriend, Mandy (source), the tale grows shaggy. *He did not invent the device. Here’s the scoop.